We learn about motives in order to start healthier conversations; conversations with God, others, and ourselves. In the final part of this step we will look at our internal conversations. In step four we will look at our conversations with God and in step five our conversations with others. A large part of overcoming disordered eating is navigating conversations between your old self and new self (Eph. 4: 20-24), the spirit and the flesh (Gal. 5:16-24), or your sin nature and your new nature in Christ (Rom. 5:12-21). The Bible speaks of this internal battle in many different ways. Recognize the distorted motives above as belonging to your old self, which is bent on destruction. Express faith by doubting the messages of your old self. Challenge the messages of your old self with the truth of what God says about who you are. Choose in ways that honor God and contribute to your flourishing based upon God’s truth. 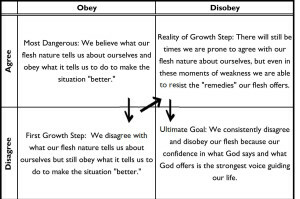 Realize in this process you have four options about how to address the messages from your old self or sinful-flesh nature. These four options are represented in the chart below (click image for clearer text). Hopefully, what you see in this chart is that you do not have to condemn yourself for hearing the destructive messages of your flesh. 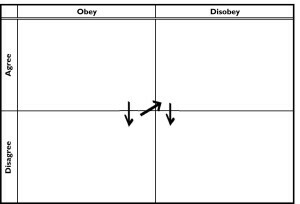 Instead, your goal is simply to disagree and disobey. The part of you that clings to these destructive messages is slowly being put to death through faith and obedience. Don’t allow a sense of condemnation over your flesh’s continued presence to strengthen your flesh through guilt, shame, or a sense of failure. 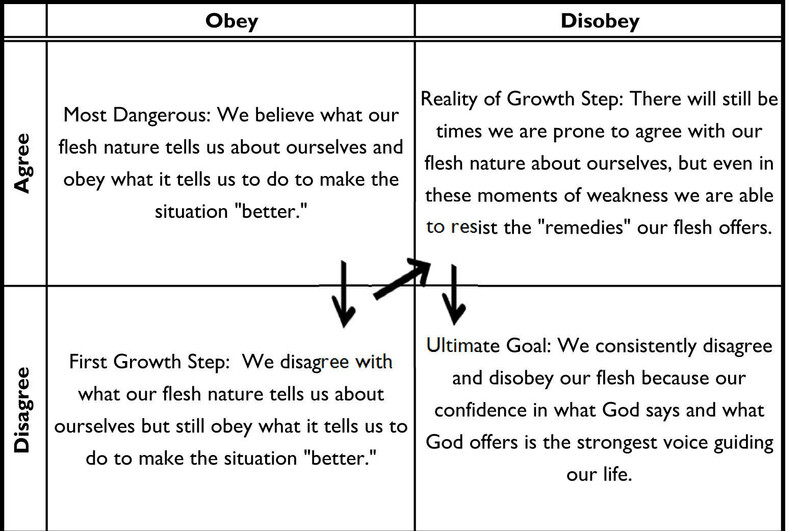 Pick one of the dominant motives for your disordered eating ( __________ ) and fill in the blank chart below with what your internal dialogue is likely to sound like as you grow into the freedom God has for you. Use this chart (whether you write on it or not) to help you identify what your options are in moments of temptation. When you take the time to articulate your four choices, instead of just feeling pressured by your temptation, the best choice not only becomes “obvious” but it also becomes easier (not to say “easy”). In an effort to help you further your understanding of your relationship with food, we will offer you one more tool in this chapter. This journaling tool is meant to help you begin to organize your experience with temptation into the categories provided in this seminar. Parts of this tool will reference future elements of this seminar, but if you begin using it now, you will develop a better understanding of your baseline response to those aspects of the change process. You might ask the question, “Do you really think journaling is going to make me stop my disordered eating?” or, “If I journal and still engage in my unhealthy eating behaviors, have I failed?” The answer to both questions is “No.” Every moment of temptation is a time for us to learn. If you learn, you may still fall, but you are a step closer to victory than if you fell blindly. In this sense, journaling is an act of defiance that refuses to be passive even when you are at your weakest.